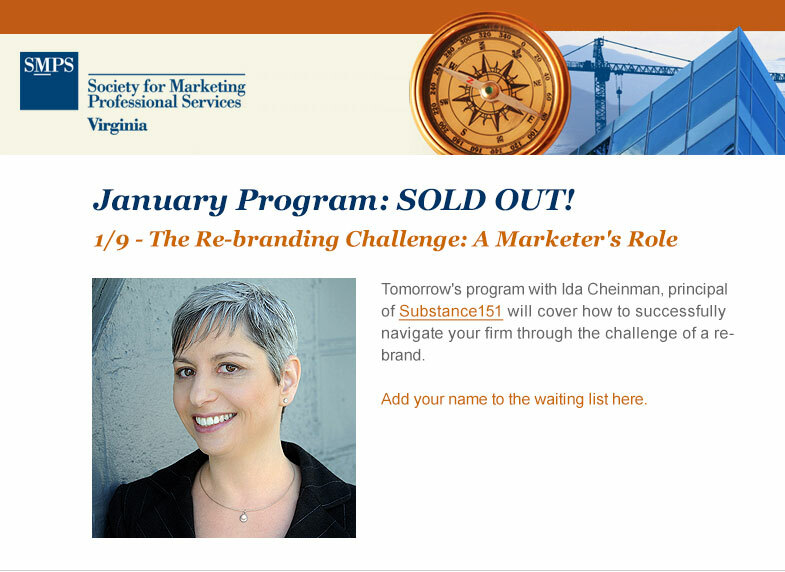 Ida Cheinman, Substance151 principal and creative director, will present “The Rebranding Challenge: A Marketer’s Role” at the Society for Marketing Professional Services (SMPS) Virginia’s educational program. Successfully navigating your firm through a rebrand can be a career high point. It’s also a monumental challenge. The role you choose to play in the process and how you play it will make an equally monumental difference in your credibility and the perceived value you bring to the firm. So how do you ensure that you stand out as a strategically smart and brand-savvy leader from beginning to end? The presentation will answer this and many other questions related to rebranding an A/E/C firm, introduce related case studies and share best practices.